Dental implants are becoming one of the most common dental procedures. At Eggert Family Dentistry we are working with our patients to replace missing teeth with dental implants nearly every week. If you’re missing teeth, implants help restore your smile long-term. Most of our patients have a lot of questions about this procedure. Here are some of the questions we hear most frequently. Dental implants are medical-grade titanium posts that are placed in the upper or lower jaw by an oral surgeon or periodontist. Implants provide an anchor for replacement teeth. They are very strong. Once implanted, new bone fuses with the device, holding it in place. This process is called osseointegration. Sometimes, dentists can install replacement teeth immediately after placing dental implants. Other implants require osseointegration to be complete before replacement teeth can be installed. This can take up to several months. 2. Who is a candidate for dental implants? Patients who are missing one or more teeth are likely good candidates for dental implants. Replacing missing teeth can help improve speech, chewing, and mouth comfort. Most patients also enjoy higher confidence and a radiant, complete smile. 3. Will my body reject a dental implant? The materials used to construct a dental implant are compatible with the human body. It is rare that a patient’s body rejects a dental implant. In most of these cases, the patient is allergic to titanium (which is very rare) or the patient is severely immunocompromised. Sometimes, a patient’s body will reject a dental implant due to inadequate oral hygiene and care post-surgery. Replacement teeth require the same care as our natural teeth. Regular brushing, flossing, and recare visits will greatly reduce the chance that your dental implants would fail. Also, occasionally, a bone graft is needed in order to get enough anchorage into the bone by the dental implant. In rare instances, there can be complications with the graft material. 4. How long do dental implants last? Dental implants can last decades with the proper care. This includes following good oral hygiene habits such as regular brushing, flossing, and preventative care visits to Eggert Family Dentistry. We’ve had patients whose dental implants have lasted the rest of their lifetimes. 5. Will people notice I have dental implants? Nope! It’s possible you may not even be able to tell which of your teeth are natural and which are the replacement. We design each replacement tooth to match the shape and color of your surrounding teeth so it fits seamlessly with your smile. The only time you’ll see it is on your annual x-rays. 6. What can I expect during my dental implant surgery? If you’re getting a single implant, the surgery will likely take 30 to 45 minutes. Placing multiple implants can take more time. Once the surgeon places the implant, either a temporary crown or an implant cover is most often placed as it heals and integrates into the body. Most people only need over-the-counter pain medications after implant surgery, if that. 7. How much do dental implants cost? Dental implants do require an investment. A single implant can cost between $3,000 and $5,000. But remember, they last for decades and can improve your quality of life immensely. Plus, failing to treat the cause of why your tooth is missing in the first place can be much more expensive over the years than fixing the problem now. 8. Will my dental insurance cover the cost of dental implants? It depends. Some dental insurance carriers will cover at least some of the cost or some of the components of your dental implants. . If you’re considering dental implants, we’ll help you understand what your insurance may or may not cover. 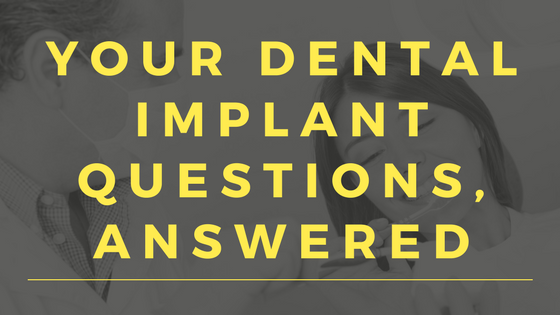 We’d love the opportunity to talk with you further about dental implants and determine if you’re a good candidate. Contact Eggert Family Dentistry today to schedule your consultation with Dr. Elizabeth or Dr. Jeff.